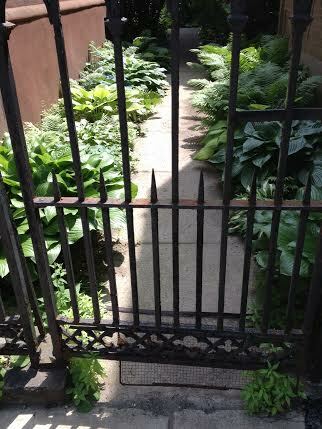 Walking down the street, this glimpse,behind the large lock, is the hint of what lies down that sidewalk. 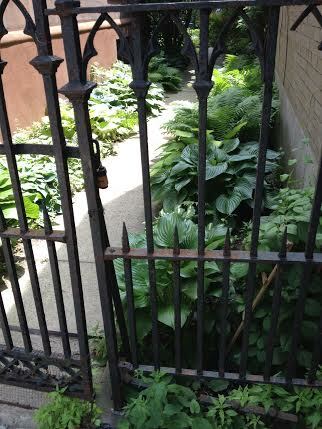 The right side is part of my garden where hosta and ferns grow with abandon. We live in a hundred year old Catholic school which was converted to apartments in the 80s. The house to the left of the sidewalk is the former rectory. The gate stays locked in a historic, downtown neighborhood of a small city, because of the challenges faced by most urban areas. We sold our late Victorian house eight years ago and husband moved into an interesting apartment in this building when I was teaching in Arizona. He called it his “vertical apartment” because the series of rooms were built into the interior fire stairs. When I returned, I wanted a garden, and not to have to walk up and down stairs to and from every room. 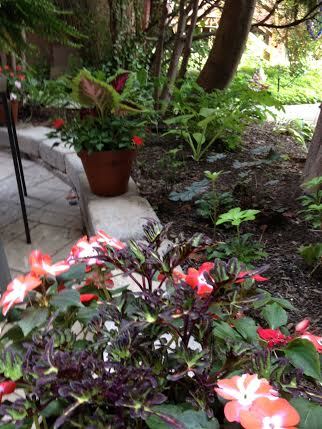 Fortunately our new apartment was available and this is the garden we had designed and created last fall. This is the partially covered window into my computer area which was a closet with a window. I loved the ivy vines that covered the walls, but it is slow to return this spring, I assume due to the killer winter we had in this area. You can see the block work we had done,too. 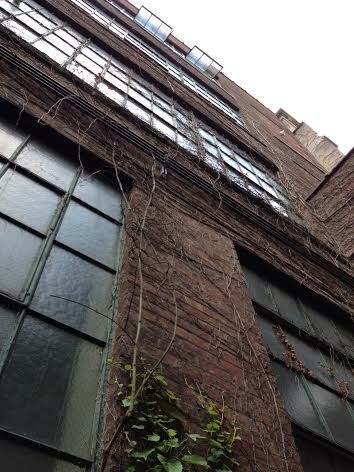 Four stories of brick,old windows and creeping ivy. . . . . I learned to use pots of color during our stays in Rome. There, balcony gardens were the only available choice. Usually they were along the rail in various pots with the tall green ficus trees in the back. 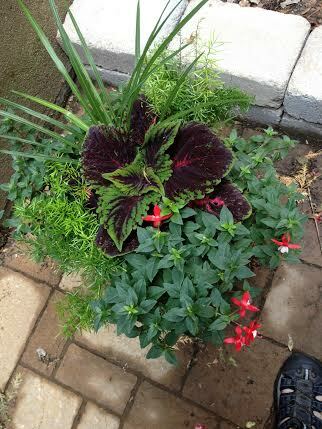 I could only use colorful coleus leaves and impatients for color but it works nicely. 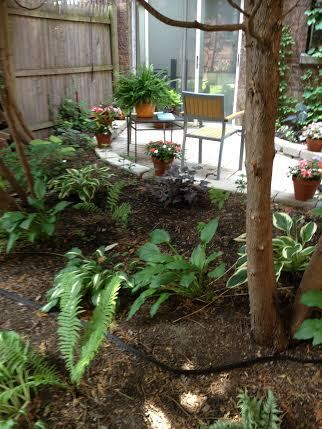 When I had the much larger garden, I would ignore directions for planting , and just buy what I wanted, thinking, “They will get enough sun!” But with experience come knowledge and I know the plants won’t grow well unless they feel comfortable in the surroundings. 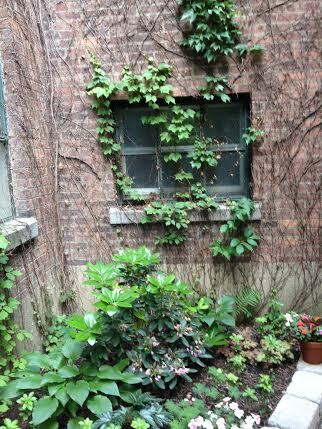 I knew from the start of this garden that it was a secret shade garden tucked in between two tall buildings. As a child, I love the book Secret Garden. . and now I have one ! We have a fire pit in the background, and the ugly trash bag is to keep out the rain water. 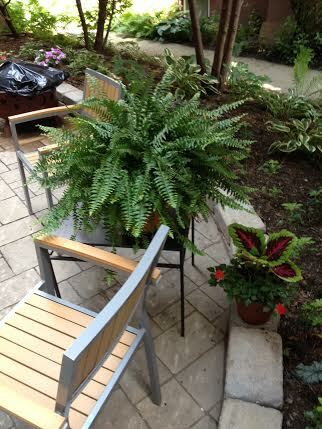 I used hanging Boston Ferns all around the wrap front porch at 30 Myrtle, so I had to have at least one fern as they love the shade! I do have one pot of fushia, which is a shade pot but not nearly up to full bloom as yet! Just outside the sliding door and you can see the paving pattern. Do you have a garden? Shade or sun? Do you visit gardens when you travel? This entry was posted in Travel, Uncategorized, USA and tagged blogging, garden, gardening, happy plants, photography, shade garden. Bookmark the permalink. Have you heard the music by Secret Garden? I love it! 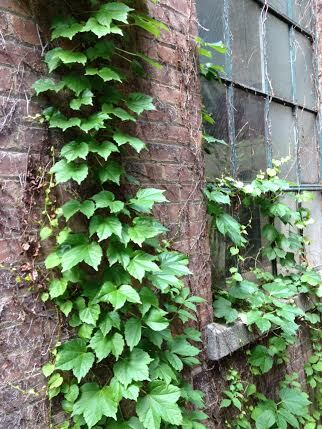 Beautiful vines and a cozy feeling here. No I will check it out! Good description . Are they Irish? It really is! I think they are Irish. Thanks for your visit and following. You also got a new follower, you blog looks very interesting. Thank you and welcome, Irene. I look forward to getting to know you too ! And welcome to you Annetbell, we will – by time. You have a very lovely secret garden there! So glad you enjoyed your visit ! I also like those vines on the walls. I am wondering whether they are good for the wall or not. I am afraid they are not good there. Well, it looks like they would damage the bricks, but the land lady doesn’t remove them. Husband wanted to pull them all done as he likes very minimal look. 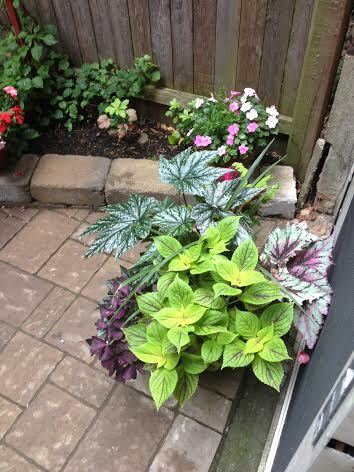 We compromised and he picked the pavers and I got to keep the wall ivy ! Good question. . . . I am so glad you enjoyed your visit. I , too, love nature and especially flowers. It was interesting that in India, gardens are the exception and not the rule. I am not sure why, but maybe it is just that there are so many people and everyone is working, working to survive and there isn’t much time to sit or walk and enjoy the natural world. Thanks for the comment. 1. As you rightly said that most people in India just struggle for a roof over their head and two square meals. Gardens, parks and trees – these are all luxuries! 2. It is ironical that the rustic lifestyle was holistic, natural and green, but nowadays all the bad western habits are being lapped up by Indians and the result is that Indians are falling prey to a host of lifestyle diseases at ages as young as 25. Oh, that makes me sad! The Indian lifestyle and culture is so wonderful,it should be cherished. I am so sorry to hear about diseases caused by emulating westerners. I hope that will stop. . . . . .
we are kinda that way too, eh?